Here's an easy idea that worked really well with both my three-year-old and my 17 month-old. 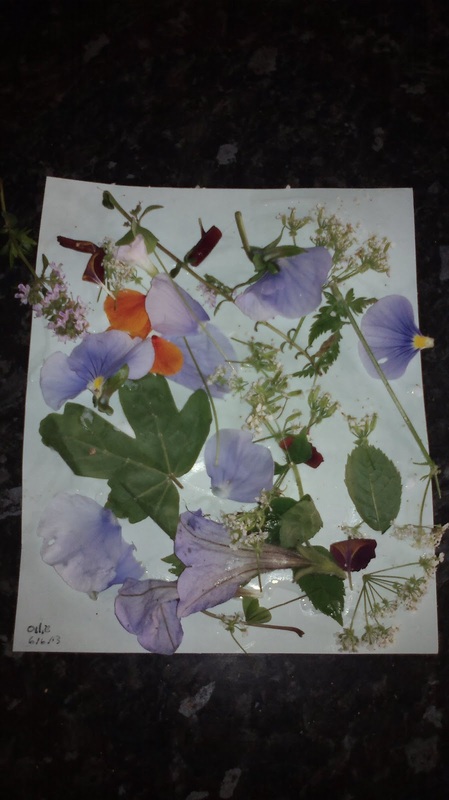 We collected a few flowers and leaves from the side of the path on our walk, and from our garden. I cut the backs off some old cards (the kind where the writing is on a paper inlay, so the card itself is blank). We dribbled and spread PVA glue on the card (gluestick would work too, but I find PVA holds better). I helped the boys pick off the petals from the big flowers and small inflorescences from the umbellifer (cow parsley, see note at bottom). The boys then chose which bits of vegetation they wanted and stuck them all on. I was expecting my eldest to enjoy this, but was amazed by how quickly my youngest caught on to what we were doing and joined in. He excitedly gestured to the bits he wanted next, and re-stuck any that fell off. The pictures are currently stuck to the fridge with magnets while the glue dries, but will then need to get thoroughly pressed to push out the moisture and preserve the flowers, after which they should keep well. I haven't got a flower press, but I find layers of paper from the recycling box either side of the flower to be pressed, then piled high with books seems to do the trick. On the face of it this is a really straightforward activity. The time it takes will depend on how long your flower foraging lasts, but expect no longer than 10 minutes attention time from small children when doing the actual sticking. The foraging part is a handy botany lesson in which things they can touch or should avoid and helps with pattern recognition. The sticking is a lovely creative activity that encourages them to think about colours and composition and breaks any ideas that may be forming that art is just drawing and painting. In addition, this is a wonderful sensory activity, feeling the different textures of the leaves, seeing the colours and smelling the flowers. The scent of the wallflower petals is still permeating my kitchen now, despite us having made the pictures hours ago. The language skills being developed are an added benefit as you can get your little one to describe what they're making, and the colours, textures and smells. 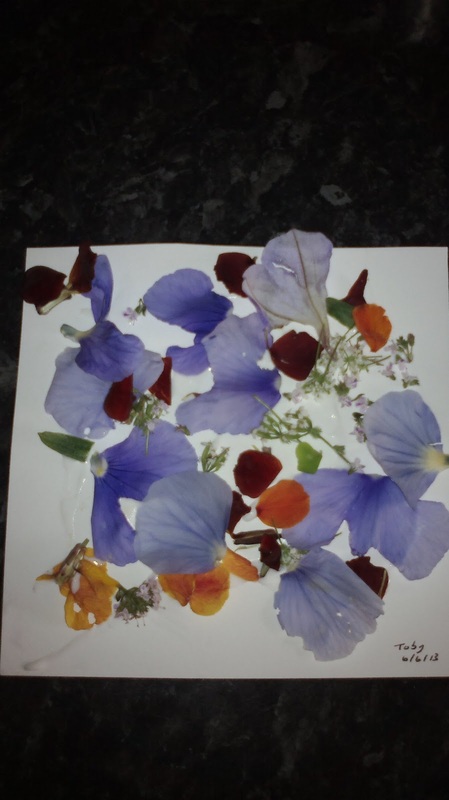 Older children may like to use the petals to form a picture of something, perhaps a flower made of flowers and leaves, or a circular mandala. This kind of activity is also a really good mixture of activity and quiet(ish) concentration time, with the sticking part being a nice break in between running around on our walk and running around on the patio playing with the sand and water trays. This is only a very rough guide, but here's a sort of risk assessment/ suggestions of things to watch out for. I let Ollie start collecting hedgerow things under close supervision at about two and a half, when he could reliably follow instructions to keep his hands off certain things and not put everything in his mouth, but this varies from child to child so if in doubt, perhaps instigate a rule where they pick only what you point to. Toby was only let loose picking in the garden as I know that I haven't got any poisonous or harmful plants there. Teaching kids some basic plant identification skills for things to avoid is really useful. In the UK that includes stinging nettles, brambles and other prickly things, ivy (probably fine for them to hold, but I'm never 100% confident it's not going to get nibbled), daffodils, buttercups and arum lily. There's plenty of others that are not nice, but they're our most common local things. We used cow parsley in our picture, but if in doubt avoid as it has nasty cousins such as hogweed. We've all been drilled in this country not to pick wild flowers, but common sense will tell you that common and abundant weedy species in public spaces (e.g. dandelions) will not cause any raised eyebrows. Stick to edible flowers and leaves such as pansies, nasturtiums, dandelions and daisies if you're doing this with toddlers or older kids who still put everything in their mouths.